The Kyoto year is packed with interesting festivals and events. Here is a summary of Kyoto’s biggest and most interesting annual festivals and events. The festivals and events listed here are the big ones. Be sure to check our monthly events pages for smaller and one-off events that might be of interest. Just search for the month in question using the search box on this page. In addition to the annual events listed here, don’t forget the two monthly flea markets held in Kyoto: the Kobo-san Market held on the 21st of every month at To-ji Temple and the Tenjin-san Market held on the 25th of every month at Kitano-Tenmangu Shrine. For information on what the weather is like each month in Kyoto, check out our Best Time to Go to Kyoto page. On New Year’s Eve, and on the first three days of the New Year (1, 2 and 3 January), Kyotoites visit either their local neighborhood shrine or one of Kyoto’s major shrines to pay for luck, success and health in the New Year. Visitors to Kyoto are more than welcome to join. Just be ready for crowds! 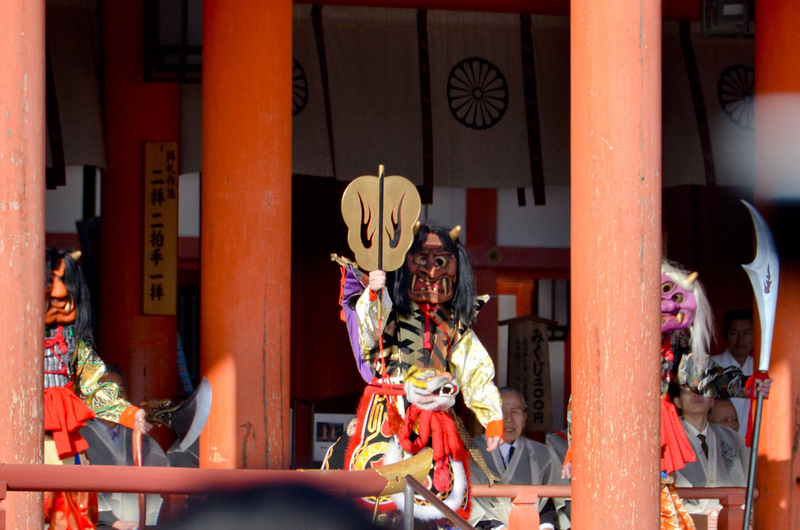 For more on Hatsumode see our New Year’s in Kyoto page. This is one of our favorite Kyoto festivals. It’s held at Ebisu-jinja Shrine, which is a short walk from either Gion-Shijo or Kiyomizu-Gojo Stations on the Keihan Line. It happens all day from the 8th to the 12th, but it’s best to go in the evenings, when the place gets packed and raucous. Ebisu-san is one of the Shichifukujin, the Seven Lucky Gods of Japanese mythology. Ebisu-san is the god of prosperity and so anyone looking to get rich shows up to ask for Ebisu-san’s blessings in the New Year. The main part of the ritual is throwing some cash into the donation box in front of the main hall, then ringing the bell and saying a prayer to Ebisu-san. After praying to Ebisu, people make their way around to the right side of the main hall and bang their fists on a board there and repeat their prayers. Ebisu-san is said to be hard of hearing – hence the need to make a racket. For full details, see our Toka Ebisu page. Setsubun marks the beginning of spring according to the old lunar calendar in Japan. Because it marks a new beginning, it’s the time to caste off old bad things and invite in good new things. At homes, people throw roasted soybeans out the door of their houses while shouting “Oni wa soto! Fuku wa uchi!” (Devils out! Good luck in!). People also commonly eat one roasted soybean for each year of their life, plus another for good luck in the coming year. 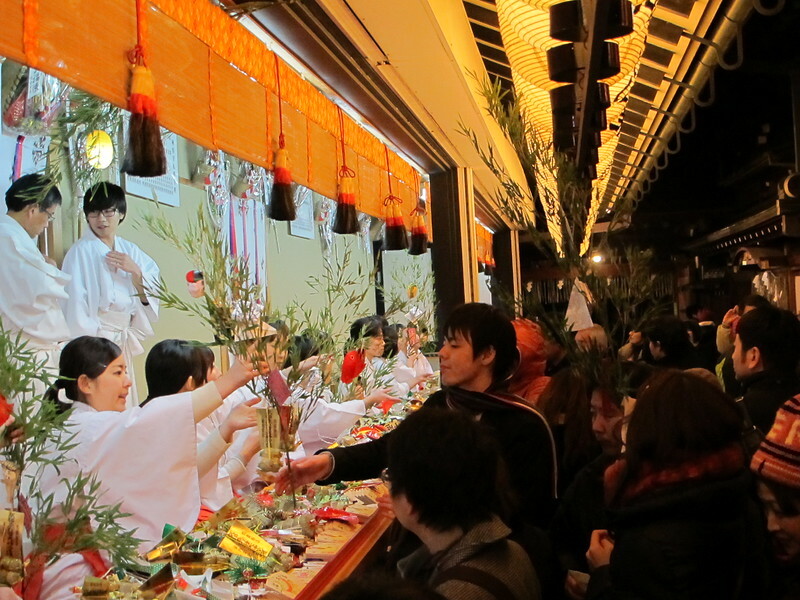 Various temples and shrines around Kyoto hold Setsubun events, including Yasaka-jinja Shrine, Hiean-jingu Shrine, Yoshida-jinja Shrine, and Tenryu-ji Temple. Check the Kyoto February Events page for full details. Higashiyama’s Hanatoro is one of the cooler events of the Kyoto year. It’s held in the Southern Higashiyama sightseeing district. Lanterns are placed along the lanes and roads of the area, all converging on Maruyama-koen Park, where various light sculptures and installations are on display (provided by Kyoto art school students). The effect is utterly magical. There is no better time for a stroll in this area. Don’t miss it if you’re in town. For most of March, one or more of the major temples in the Southern Higashiyama District hold special evening temple illuminations, in which the buildings and gardens are illuminated. The effect is magical. 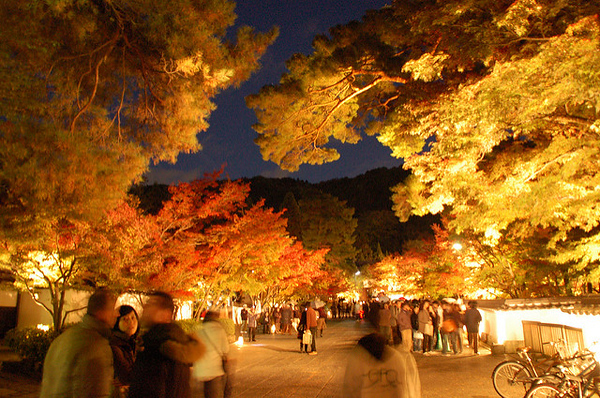 Temples holding illuminations include Shoren-in, Kodai-ji, and Kiyomizu-dera. Check the March Events page for full details. Each of Kyoto’s five geisha districts holds a major series of dance performances once a year. Four of these happen in the spring. This one, held by the geisha houses of the northern Kamishichiken Geisha District, is very special. The scale is rather intimate and the dance is always superb. It doesn’t necessarily feel like stepping back in time, it feels more like stepping out of time. 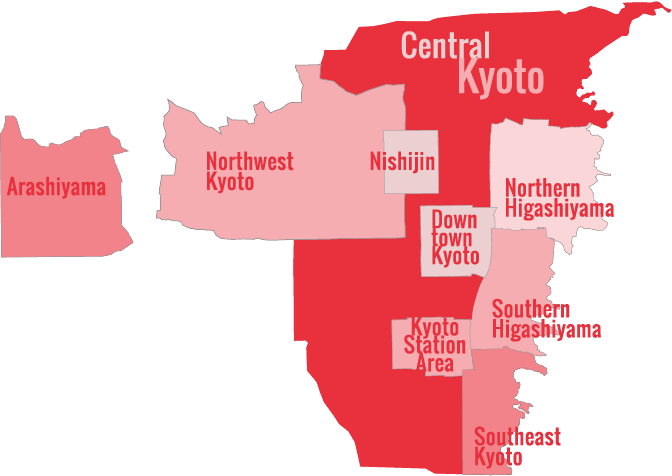 Check out our Kyoto Geisha page for more details on Kyoto’s geisha. See the March entry above for details on this geisha dance. The second largest and grandest geisha dance in Kyoto, this one is put on by the Miyagawa-cho Geisha District. It’s a first-rate performance in every way and you should do everything in your power to catch a performance – it will be unforgettable. Some private tour operators and concierges can help you get tickets to the performances. Check out our Kyoto Geisha page for more details on Kyoto’s geisha. For most of April, to coincide with the cherry blossoms, one or more of the major temples in the Southern Higashiyama District hold special evening temple illuminations, in which the buildings and gardens are illuminated. The effect is magical. Temples holding light ups include Shoren-in, Kodai-ji, and Kiyomizu-dera. Check the Kyoto April Events page for full details. This is the mother of all geisha dances. 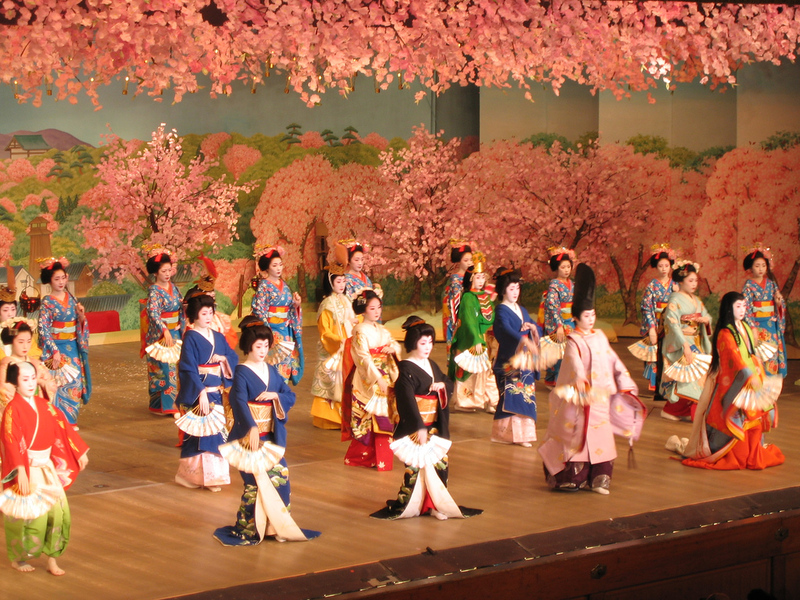 Put on by the girls of the main Gion geisha district in a huge hall, this is a sumptuous feast for the senses. The number of geisha, the constantly changing sets, the outright bizarre sounds from the musicians and singers, it will be like nothing you’ve ever experienced before. If you can go, by all means, GO! You will not regret it. Private tour operators and concierges may be able to source you tickets. Check out our Kyoto Geisha page for more details on Kyoto’s geisha. During most of the month of May, the girls of the Pontocho geisha district perform the lovely and quaint Kamogawa Odori dance in the Pontocho Kaburenjo hall, overlooking the eponymous Kamo-gawa River. While not as grand as the famed Miyako Odori, this dance is superb and you should make every effort to see it. Private tour companies and hotel concierges can help you secure tickets. Check out our Kyoto Geisha page for more details on Kyoto’s geisha. Yabusame, or horseback archery, is Japan’s most thrilling sport and this is your best chance to see it. 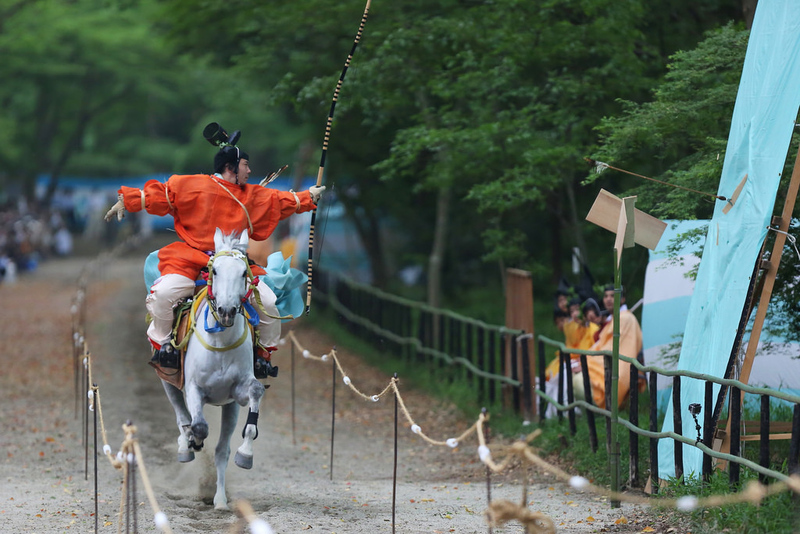 Held in the long arcade that runs through the middle of the beautiful Tadasu-no-mori forest at Shimogamo-jinja Shrine, this event allows you to get really close to the horses and riders as they thunder past the targets, unleashing arrows as they go. I cannot stress this enough: If you can possibly get yourself to Kyoto on 3 May, do NOT miss it! 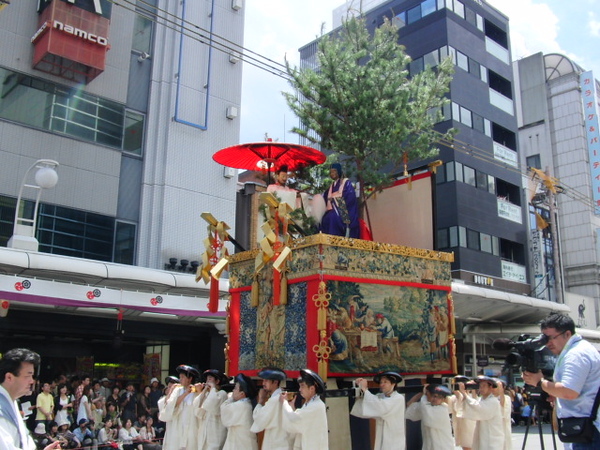 The Aoi Matsuri is one of Kyoto’s three most important festivals (the other two are the Gion Matsuri and the Jidai Matsuri, held in July and November, respectively). The festival commemorates the time when a sixth-century emperor sent a retinue from the Imperial Palace to Shimogamo-jinja and Kamigamo-jinja shrines in hopes of appeasing the deities and ending a series of disastrous crop failures and epidemics. These days, the festival includes a procession from the Gosho (Imperial Palace) starting at 10.30am and continuing to Shimogamo-jinja Shrine and finishing at Kamigamo-jinja Shrine (arriving there around 3.30pm). The best places to watch the procession are in the Kyoto Gyoen (Imperial Palace Park) and the Tadasu-no-mori at Shimogamo-jinja Shrine. Okay, it’s not a festival, but this exhibition of Kyoto’s most skilled artists is always well worth seeing. 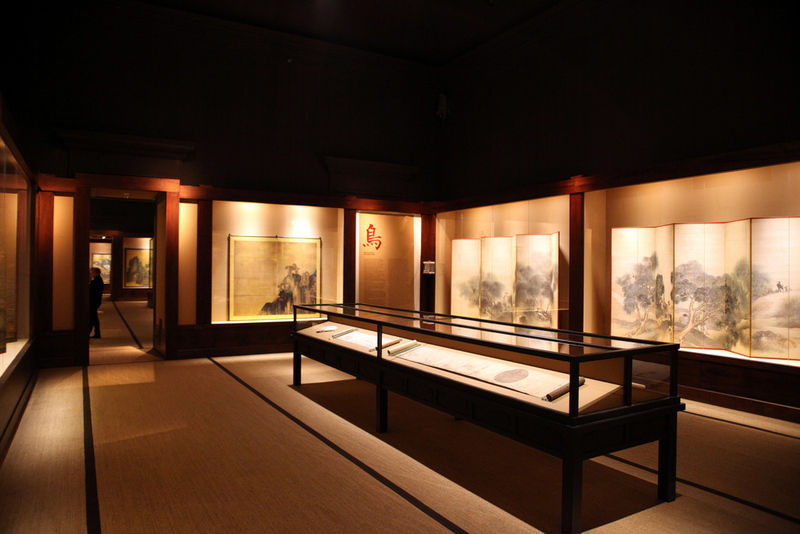 It’s held at the Kyoto Municipal Museum of Art for about a week in early June. Check the Kyoto June Events page for details. The Gion Matsuri is Kyoto’s biggest annual event and one of Japan’s most important annual events. 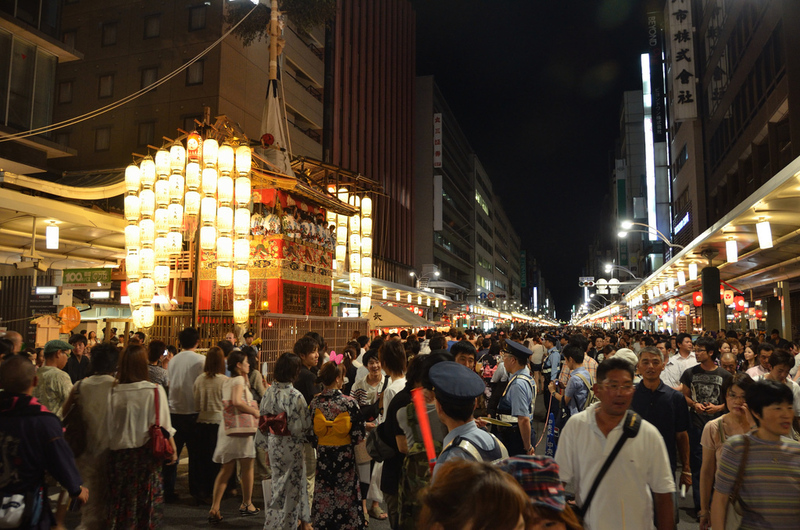 It’s also a huge summer block party in which locals and visitors gather to promenade in colorful yukata robes and gorge themselves on street food and beer. The main events are two processions of traditional parade floats, held on 17 July and 24 July. For three nights leading up to each parade, there are “yoi-yama” street festivals in which Kyotoites dressed in yukata mingle among the parade floats. For full details, visit our Gion Matsuri page. Gojo-zaka, which leads up to Kiyomizu-dera Temple, has always been known for its pottery. And, this three-day event celebrates that fact. If you’re a fan of pottery, get yourself there, but don’t expect to buy any treasures from unsuspecting merchants – these folks have been at it for decades. This is the highlight of the month of August. 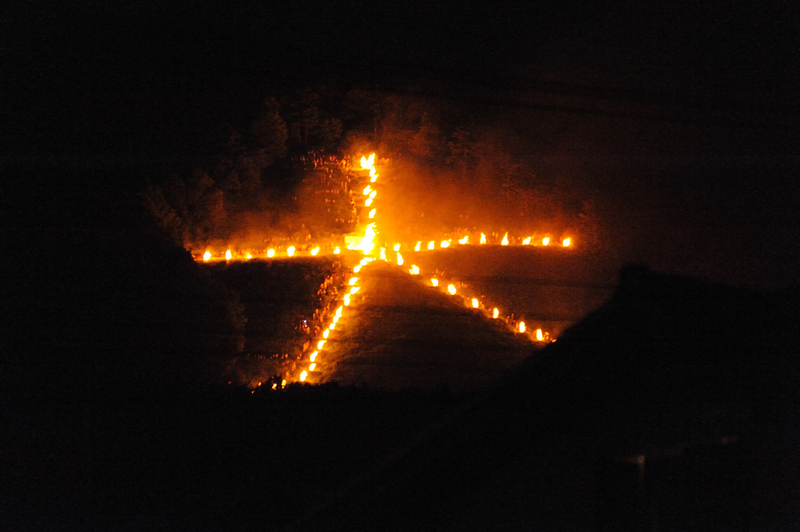 More commonly known as the “Daimonji Fire Festival,” this is when they set those massive Chinese characters on the hills around town ablaze. The main mountain is the eponymous Daimonji, which towers over Ginkaku-ji Temple and the rest of northern Higashiyama. It’s set alight promptly at 8pm, and the other four mountains are set alight in counterclockwise fashion every 15 minutes. The best places to view the scene include from the east side of Yoshida-yama, parts of the Kyoto Gyoen (Imperial Palace Park), parts of the Kamo-gawa Riverbank, and, if you can afford it, a hotel rooftop beergarden. The harvest moon of September is usually spectacularly bright and clear. 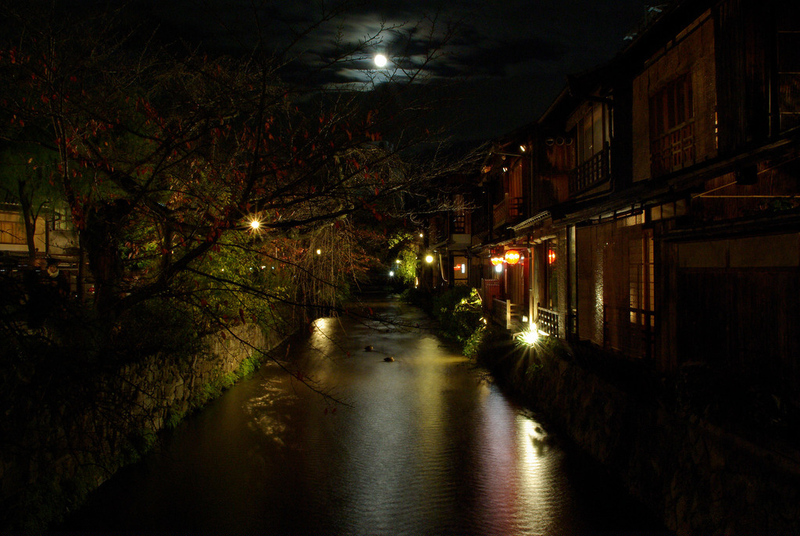 In the evening on the night of the full moon in September, moon viewing events are held at various shrines and temples around Kyoto, including Shimogamo-jinja Shrine, Kamigamo-jinja Shrine and Daikaku-ji Temple. Check the Kyoto September Events page for details. October 22nd is one of the biggest days of the year for Kyoto festivals: In the daytime, you can catch this event, and then head north in the evening to check out the Kurama-no-himatsuri (see following). The Jidai Matsuri, which means “Festival of the Ages”, involves a parade of people dressed in outfits from all the major Japanese historical periods. The parade route goes from the Kyoto Gosho (Imperial Palace) to Heian-jingu Shrine. It was first held in 1895, as a response to the relocation of the capital from Kyoto to Tokyo (the Kyoto government feared a loss of prestige and tourism). The best place to watch the parade is just after it departs the Gosho and makes its way through the Kyoto Gyoen (Imperial Palace Park). The parade starts at noon and reaches Heian-jingu around 2.30pm. This is arguably the most exciting festival of the year in Kyoto. It’s held in the village of Kurama, about 30 minutes by train from Kyoto. 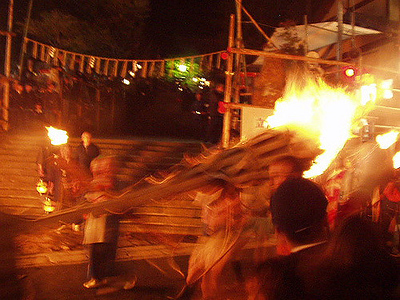 Teams of shouting men carry huge flaming torches through the narrow streets of this tiny mountain village. The atmosphere is positively primeval. After the parade, people gather round outdoor fires to drink. Just be warned that the trains to/from Kurama will be packed. Go early and stay late. And don’t get on that train before relieving yourself, especially if you’ve had a few beers. The Gion Higashi geisha district puts on their annual geisha dance in the Gion Kaikan hall on Higashioji-dori in early November. This is the smallest of the city’s five geisha districts and their dance is both intimate and somewhat quaint – a stark contrast to the grand Miyako Odori held by the main Gion geisha district. This is part of the charm of the event. Also, this is the only major geisha dance to be held in the fall. Thus, we highly recommend this dance if you happen to be in town. Hotel concierges and high-end ryokan can usually help with tickets. Check out our Kyoto Geisha page for more details on Kyoto’s geisha. For all of November, to coincide with the fall foliage, one or more of the major temples in the Southern Higashiyama District hold special evening temple illuminations, in which the buildings and gardens are illuminated. 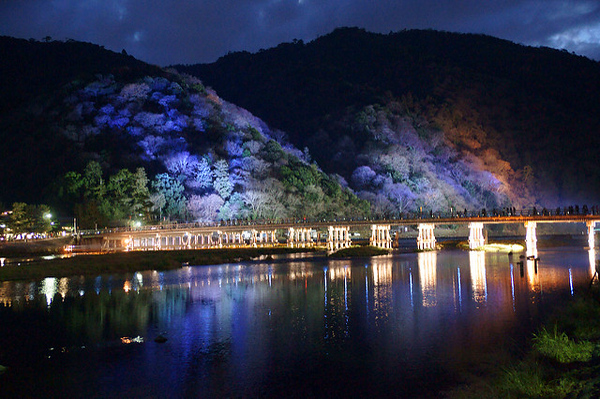 Other illuminations are held in Northern Higashiyama. The effect is magical. Temples holding light ups include Eikan-do, Shoren-in, Kodai-ji, Chion-in and Kiyomizu-dera. Check the Kyoto November Events page for full details. This is a magical event: thousands of lanterns are placed along the lanes of Arashiyama, including the walkway through the famed Arashiyama Bamboo Grove. The effect is otherworldly. And you’ll find beautiful ikebana (flower arrangement) installations scattered about. If you’re in town, don’t miss it! Check the Kyoto December Events page for details. After feasting on New Year’s Eve, many Kyotoites head to their local temple to perform joya-no-kane, a sacred bell ringing ceremony. Here, people line up to ring the giant temple bells and wish for good fortune in the New Year (and to get rid of bad karma from the old). Technically, the bells are supposed to be rung 108 times, a number symbolizing the sins to which the flesh is heir, but many temples will allow everyone a chance to ring the bell even if it exceeds this number. For more on Joya-no-kane see our New Year’s in Kyoto page.